The original facilities were constructed in time for the 1991 vintage. As the company and vineyards grew it became neccessary to expand. A new purpose built barrel hall was constructed in 1999. This was built from thermomass concrete and is temperature controlled to minimise losses due to evaporation. 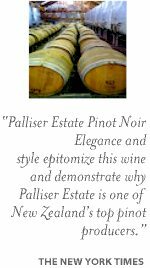 The winery's works were re-developed in time for the vintage of 2002, and Palliser can now process 600 tonnes of fruit. Ata Rangi means new beginning or dawn sky. The site was a barren 5-hectare paddock when Clive Paton bought it in 1980. 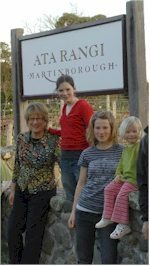 He was one of a handful of winemaking pioneers in Martinborough, then a forgotten rural settlement, who were attracted to the area by three key features - the localised, free-draining shingle terrace some 20 metres deep, the lowest rainfall records of anywhere in the North Island, and the proximity to the capital city of Wellington, just an hour away. Clive, who'd farmed in the area, knew the land well. 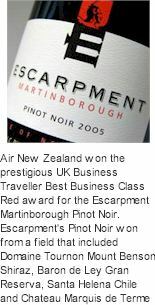 He chose mainly red varieties - Pinot Noir, Cabernet Sauvignon, Merlot and Syrah - and set out in pursuit of world class wines. Pinot Noir's potential shone from the start - the early wines widely appreciated for their texture and for their pure fruit expression of the variety.